Completely Free with free telephone and email support. Facilitates Multiple Users. As a multi user system, the software grants each user the appropriate level of access. Offers a host of modules including accounts payable, accounts receivable, general ledger, business intelligence reporting and electronic record keeping, etc. In addition, users can also expect free technical support. Click this link to go to Free Accounting Software. Please fill the below form to download the Accounting Software. 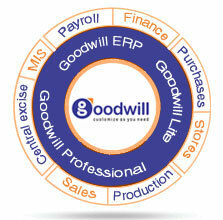 Users are welcome to the free usage of Goodwill's Free Accounting Software, an easy to use complete multi-user/multi-company/multi-branch Windows-based accounting, solution for your business. Designed to be easy to use, yet powerful and flexible, Goodwill Accounting allows you to track bank accounts, stocks, income and expenses. As quick and intuitive to use as a checkbook register, it is based on professional accounting principles to ensure balanced books and accurate reports.